A bit about me then. Well I live in a small town in Yorkshire with my boyfriend and our miniature dachshund, Maximus – he’s a regular over on Wellies and Wonder FYI. I am a physiotherapist by day, home and lifestyle blogger by night. I’m a huge believer in happiness and doing whatever it is that brings that to you. For me it’s dog walks, coffee in the sun and laughing until my tummy hurts. It’s taken me a while to find my happy and accept that it’s not always going to be everyone’s cup of tea but in case you didn’t know ladies and gents we are here for one time only so don’t ever let anyone tell you how you should go about finding your happy. So how did I get into Instagram and blogging. Well, when we bought our new house I was super excited and started to spam my Instagram like there’s no tomorrow. I realised that not all of my friends want to see that so I set up Wellies and Wonder. This quickly became more than just a diary of my new home but also our new life and I soon found myself striking relationships with some wonderful people in the “instahome” community. When I received my lampshade I couldn’t have been happier. Amazing quality! The print is vibrant and detailed and pictures really don’t do it any justice. One of my favourite features is the metallic interior. It is such a striking feature and it’s what people have commented on the most. It also gives off a warm glow which is exactly what I was looking for when creating my botanical corner. 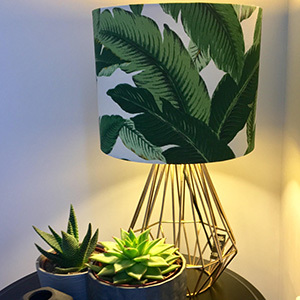 So I paired my new lampshade of dreams with a gorgeous gold geometric lamp base. I did also have a black geometric one but with my side tables being black it all just blended together which is not what I wanted at all. I think the shade would have worked well on a cement lamp base too especially if you wanted a more industrial feel. I also added in a gold basket to add some luxe plus I needed some storage… pretty and practical? Winner winner! Finally I accessorised with some succulents… come on what did you expect? If you haven’t seen my blog or Instagram before I should inform you that: I am hayley and I am addicted to succulents. I am the founder of succulents anonymous. I used different heights and textures when choosing my pots. Finally I added my personal grey coasters with gold initials to tie all the colours together.